The maximum cash out from this bonus is 10 times the bonus amount awarded. Deposit #2 - 100% match with a max value of R4000. Deposit #3 - 100% match with a max value of R4000. At first glance, JackMillion Casino definitely looks like a winner. The site has a rolling jackpot total ticket which can be expanded to show the massive amounts in the different types of progressive, plenty of games on the front page and all the useful links you’d need. The casino has plenty of different promotions including quite a nice welcome bonus as well as some other promotions that will work for you throughout each week. The site offers a number of different deposit and withdrawal options, support in a number of different languages that’s on offer 24/7. JackMillion also offers download and instant play games across the board including many different types of pokies, table games and many more. JackMillion Casino is dependent on Real Time Gaming (RTG) software. This means that while you’ll still get a fantastic online casino experience because RTG is a popular name in the industry, you’re going to miss out on some of the popular games because they are hosted by other software providers. It’s definitely not a scenario where it’ll make you choose another casino first, but something to keep in mind. Another thing that we found perhaps disappointing rather than a problem for the review team, is that JackMillion doesn’t offer any live casino games. This is one of the problems when only choosing to partner with one software provider as RTG likes to make popular pokies rather than focus on other types of games. Having said that, RTG does offer a number of great pokies and progressive slots at JackMillion. Not only does it focus on the slots and pokies, but you’ll also get to experience some video poker games, table games and specialty games too. Some of the top progressives like Jackpot Pinatas, Aztec’s Millions, Cleopatra’s Gold and Spirit of the Inca will be available to you. If you enjoy table games, you can try different varieties of blackjack, and some of the more interesting table games like baccarat and Keno. You’ll find that almost all of the games at JackMillion have a button to play now and a practice button. That means that you don’t need to spend your real money on games that you don’t fully understand yet and you can just give them a go through free play gaming options first. Our review team struggled a little bit with the mobile version of the JackMillion Casino site. Not only did we find that it wasn’t responsive to our liking, but the few devices that were used to test it, lacked the basic fundamentals of Flash in order to play. It feels like JackMillion has been designed to support desktop and PC more than mobile. The reason that most people head on over to mobile is so that they can play on the go and while you can still do that with JackMillion, it feels like it’s a bit of an added effort to do so, especially considering that you’ll need to download software first before you do it. The games that you can play through instant play modes run on Flash, something that a lot of phones don’t have standard, but that can be downloaded and installed. Of all the games that you’ll get to experience through RTG at JackMillion, there are around 70 that have been optimised for mobile. This means that you’ll be able to play them directly on your smartphone or device without having the download anything extra. It doesn’t seem to matter what device you have here because our review team have tested both Android and iOS devices. Thanks to the wide range of progressive jackpot games from RTG, at JackMillion you can get access to some of the bigger ones on the market right now. Unfortunately you won’t be able to play a game like Mega Moolah, but games like Aztec’s Millions, Jackpot Pinatas and Shopping Spree II are just a few of the games that have become instant millionaire-makers. Aside from those popular progressive jackpot slots, you can also give some of the card games a go in Caribbean Stud Poker, Caribbean Hold’ Em and Let ‘Em Ride. All of these progressive games and pokies offer a great chance to win big! When you sign up and join JackMillion Casino, you’ll grab a great welcome bonus of $1000 including 200 free spins! When broken down, you’ll get 100% on $200 on your first 5 deposits, and the 200 free spins are broken down into 40 spins per deposit using the JackMillion Casino promo code: WELCOME. Wednesday brings with it, Insurance Fever. Get up to 20% insurance cashback from Jack based on your deposit whenever the house wins. Finally, Jack also offers a weekend package where you can get a 50% matched deposit bonus up to $500 on two deposits during the weekend. While not necessarily a promo code, you can get some great rewards and bonuses by being a VIP at JackMillion Casino. You can receive amazing benefits like cashback, higher deposit and betting limits, personal account managers and gifts! You’ll need to increase your tier on the number of Comp Points you earn throughout your time playing at JackMillion. Players at JackMillion will be able to contact their support team 24/7. You can use the live help service where you’ll need to put your name, email and username in, then you’ll only have to wait a few minutes before you’re speaking to someone on the other end. You can also contact JackMillion by email or by phone on a toll free number. You won’t find any sort of FAQ or support system on the site in a centralised area but each aspect of the casino has some information about it so you can generally get a good idea whenever you have some sort of issue that has come up. Many other review sites and places that have rated and ranked JackMillion talk about the ability for it to accept standard payment methods and ewallets. We’re not quite sure where this information has come from. On the JackMillion website and through the customer support, the only existing deposit options for players are in VISA debit, MasterCard, Neosurf and Bitcoin. All four of these deposit methods are the same in that the deposit time is instant, the minimum deposit amount is $30 and the maximum deposit amount is $500. For withdrawals, obviously the cryptocurrency method will be quicker than regular banking, but you’ll still be able to receive your money. The withdrawal speed for these options will take time to process on JackMillion’s end first of all. They require around 96 hours to process withdrawals and from there, it moves into the hands of the company processing the withdrawal. For bank wire transfers you can expect to wait between 3 and 7 business days for the transactions to be processed. Both Neosurf and Bitcoin will be a lot quicker and you should expect your real money winnings to be paid to you within 48 hours. The only downside to this is that then you’ll need to convert it into AUD. If you’re looking for a great casino for Australians then JackMillion could be it. 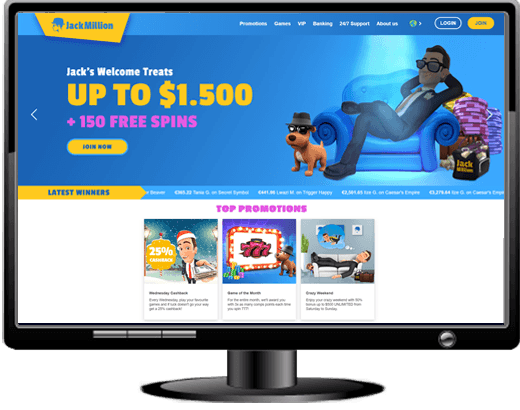 As soon as you head into the JackMillion casino login page, you know that you’ve come to a place that puts the customer first. They don’t offer too many payment options and the games come from just the one provider, but you should still find everything you need at an online casino. One thing we do need to mention though is that the customer support at JackMillion, no matter the time of day, are very helpful and we felt like we were always in good hands.